Sibling caterers, Claire and Lisa, run the first UK company to receive the maximum Three Star sustainability rating from the Sustainable Restaurant Association, providing services for events, weddings, photoshoots, film/tv shoots, office meetings and parties. Based in Central London but with partnerships and venues across the UK, Clerkenwell Green cater privately, for corporate events and weddings. Stunning, easy-to-navigate website built by Ico Design. Private and corporate catering from qualified chef Jenny McNeill’s boutique company is tailored to requirements. Based in London, they promise to ‘listen’, ‘create’, ‘cook’ and, crucially, be ‘nice’. Based in London and West Sussex, Mark Dunne’s company cover locations in Greater London, Surrey, Sussex and Hampshire, providing services for corporate events, weddings, parties and even BBQs. “All your London catering needs” are met by this entertainment industry-based company, established by chef Giles Broe, who has fed the stars from Kylie to Bon Jovi. Private catering is also available. Working behind the scenes of some of London’s most prestigious cultural venues, Zafferano’s comprehensive team, which includes two highly qualified chefs, also cater for weddings and parties with an emphasis on local and seasonal produce. Managing director Damian Clarkson has experience with clients that include the Duchy of Cornwall, Tom Ford and Oswald Boateng and has worked alongside chefs Atul Kochar and James Martin. With bespoke menus for private events and weddings, their repertoire includes some of London’s top venues, with accolades from publications such as Cosmopolitan and Tatler. The team behind the web-based home-delivery service housebites.com offers catering with a highly personal touch. An impressive roster of professional chefs design desirable menus for corporate events or special occasions and are available for private hire and participatory cookery lessons. Only sustainably sourced ingredients find their way onto a Purple Grape Catering menu, which is designed to the client’s specification. From small, private functions to large-scale public-venue hire, this London and Bath based company promises to “tantalise your tastebuds” with their contemporary cuisine. Jo Hepworth is a professional chef whose services include canape events, private dinner parties, menu planning and even cookery tuition. He has worked with Tom Aikens and at L’enclume, has just opened Hepworth’s deli in Leeds and has even appeared on Come Dine with Me – Homemade. Within the M25, London-based Bread and Honey deliver a variety of set menus for breakfast, lunch and afternoon tea, including an antioxidant-loaded Macmillan Cancer Support menu. They provide a full range of catering services for corporate and private events with an impressive portfolio that includes clients such as the BBC, Universal Music Group and Cath Kidston. Award winning Greenwich caterers Dish bring 25 years of experience to events anywhere in the UK. Whether it’s a private party, corporate event or wedding, their international cuisine promises a “visual feast”. Titbits specialise in what they call “innovative plant-based cuisine”: raw and vegan food. Paula Young and Sammy Gills head the company which covers Brighton, Sussex and the South-East, catering for large groups or parties, providing private tuition and Brighton-based cookery courses on Wednesdays and Sundays. With a food philosophy that emphasises seasonality and sustainability, this well established catering company has over 40 years experience. Based in London, it has access to a bulging portfolio of venues and brings a touch of class to any wedding, private party or corporate event. There is as much emphasis on the sheer spectacle of a party, wedding or corporate event as there is on the food with this London based company which has just joined forces with the superb Adam Byatt. The Clapham-based chef is on board to design a range of seasonal menus and even make a few appearances at Create events. From bespoke menus that promise to be “fun and flamboyant” to a professional and sophisticated service, Harbour & Jones has a strong client list and a team of over 400 that sustains their fantastic reputation. Services include canape receptions, special occasions, parties and top-level corporate dinners. This London caterer promises Michelin-star quality from its “pure and elegant” menus which promote local and seasonal food. They can adapt to special dietary needs and create an event unique to a client’s desires. Sister company, Langoustine Catering, is lower-cost, set menu based, and uniquely Scandinavian, inspired, no doubt, by founder and Business Woman of the Year winner, Lena Björck. Named “Caterer of the Year” at the 2009 Event Awards, Jackson Gilmour’s menus deliver innovative and classical food in equal measure, having fed royalty, celebrities and diplomats across London and the South East. They provide tailor-made events for a wide range of clients, including a number of charities, and can even offer eco-friendly ‘reduced carbon menus’. London caterers, Party Ingredients, can provide just that: the components for an entire event from food to entertainment. The former comes in the form of canape, dinner and grazing menus, provided at events held at some stunning locations. Clients can also choose a venue, be it their office or own home. Dynamic caterers, Rhubarb, have offices in London, Cranleigh and Henley but have traversed the globe to service presidents, royalty and events such as the Olympics and Monaco Grand Prix. Their international flavours encompass a specialist Asian and Indian menu, and their innovative flair is provided by non other than Heston Blumenthal. They can also cater to smaller, private events such as birthday dinners. Established in 2000, this London caterer is family-run and services esteemed events, private and corporate parties and weddings. They can also create a spectacle at parties with smartly designed food stalls, and put a strong emphasis on matching the food, created by top professional chefs, with quality wine. Classy caterers that service some high-end London venues including notable visitor attractions, Ampersand can also boast the lauded Perkin Reveller as part of its canon. The canape, dinner and bowl food menus are beautifully presented, while less formal BBQs are not off-limits at events from weddings to private parties. London’s Bubble Food brings “a unique experience to any event” in the shape of a range of molecular gastronomy menus created by chef Alejandro Diaz. The company’s portfolio boasts a vast list of reputable clients and its “wow factor” cuisine has fared well in press coverage. After 25 years in the catering world, Moving Venue has learned a thing or two about the industry and individual requirements of its clients. At corporate events, private parties and weddings, head chef Steve creates menus to suit the occasion. They are the only London caterer to be accredited by the Vegetarian Society for their vegetarian and vegan food. A company whose ethos encompasses ‘excellent British food with a twist’, Payne and Gunter cater for a whole host of events, from private and corporate parties, family occasions to large-scale conferences. Organisation of every aspect of the event is available and preparatory food tastings can be arranged before a menu is designed. Winner of the 2012 Event Awards for Best Caterer, this company’s recipe for success lies in its impressive list of venues and clients and relationships with the foodie community, as well as variety of interesting menus, designed by Creative and Sales Director, and Cafe Soho owner, David Wolanski. The Recipe’s services cover the full range from private parties and weddings to fashion shows and film premieres. Brighton, Sussex and Surrey services for weddings, private parties and corporate events, Gastro Catering create bespoke menus but can also offer a variety of food options from fine dining, buffets and barbecues to paella and hog roast feasts. Within their Sussex branch, professional chefs run a series of different cookery courses that showcase the company’s philosophy of local produce with an exciting twist. This smart London deli and traiteur provides a full-range of outside catering, whether you need canapés for a drinks party or a full-blown afternoon tea and cakes. Use the Comment Box below to let us know if you’ve had a good or bad experience with event caterers and tell us who you think should be in a Top 50 list. This is a really great Top 30 list. Thanks for sharing it. Capital Cooking Ltd is based in South London and always provides delicious food & great service. They offer a full catering and event management service to business and private clients. This is a great list of catering companies. I couldnt see any Caribbean Catering companies within the 30!! Trini Caribbean Catering are based near London and cover the whole South East of England. I have used “Inn and Out” caterers for a private function and they were really great. Excellent food and service!! 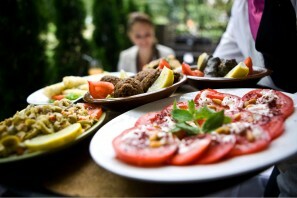 This a well thought out list of the top catering services available. I can see that there are a lot of them in London. I would say the best one out of the Top 30 is probably the London Kitchen, I know they have some VIP clients, it would be great to add what sort of pricing they charge, i.e mid range, high end etc just to get an understanding of what the creme de la creme actually cost.